This Thursday, 7 February, is Time to Talk Day. It’s an opportunity for all of us to talk openly about mental health, whether we've personally suffered poor mental health or not. And it’s a chance to learn about the different ways of reaching out, or of supporting a colleague, if one of you needs help to cope. Just knowing when to talk and when to listen can help. Having a mental health condition, even if it can’t be cured, doesn't have to stop you living a full and rewarding life. And sharing a personal experience of living with mental ill health can inspire others. So it’s time to talk mental health. But how do you find time and space to talk about such a personal issue in the face of so many pressures? It’s natural to be worried about showing ‘this is me and I need help’, but lived experience and sharing your mental health story can be great motivators for making a difference. Cecilia Da Forno is driven by her personal battle with depression to embed wellbeing, resilience and openness around mental health conditions in the recruitment and development of Civil Service Fast Streamers. Whatever your mental health condition, there are things you can do today – and every other day – to help you live the life you want to live. The HMRC Choir formed in 1948 will be performing at a ‘Time to Talk in Tune’ singing and wellbeing event in Bush House, London. A 'Talk the Channel’ challenge in Glasgow will see colleagues join for a 21-mile walk – the equivalent of the length of the English Channel – while discussing mental health topics. The mental health walks and talks in Belfast, Southend and Worthing will encourage people not to wear earphones or use their phones, so they can walk, talk and take in the views. Ipswich will have a cake and crafts day to understand ‘the right ingredients’ for creating mentally healthy workplaces, finishing the session with empty plates and a multi-coloured artwork displaying people’s ideas for making it happen. If you have the courage to talk about mental health there is a shared responsibility to listen. All senior civil servants are learning how to be wellbeing confident leaders and create work environments which feature strong relationships that allow people to flourish. These conversations should be two-way, but you have to know when to talk and when to listen. The Samaritans’ Wellbeing in the City campaign provides an active listening e-learning guide to help you do this. Check your departmental intranets for news of Time to Talk Day advice and local activities you can get involved in; and for information on Mental Health First Aiders (or equivalent), Employee Assistance and Occupational Health Providers, and Workplace Adjustments. For more information about Time to Talk Day and resources to raise awareness and support others’ mental health, please also see the Time to Change website. Thanks, as ever, for your work in this area, Jonathan. Staff Wellbeing and Mental Health networks across government will be holding events and sharing their work with their colleagues as a part of activities for Time To Talk Day. These networks do important work offering peer support and collaborating with HR and People teams in their departments. I'd encourage all colleagues to reach out to their local networks through departmental intranets. If any one needs any advice in this area, please contact me through the links to the Cross-Government Mental Health Network, above, or on twitter @XGovMHN. Thanks for this information. I can only speak for CCS in the Newport office, but last year a number of us were trained in the Mental Health First Aid course (MHFA) and we have found it extremely useful. We tend to promote the staff on notice boards and a few mentions at Floorplate meetings when required. It is becoming more and more relevant of the surrounding issues we all go through at work and at home that can affect our mental and physical well being. I think support such as this is essential in a modern thriving organisation to understand and create a work space that reflects modern day life. Promotion and raising awareness such as this is great and long may it continue. A really good piece, which much to think about and some really good ideas. However, I have to query the geography. Surely the Channel is 21 miles wide, at it's narrowest point, not long. It runs along the south coast of England, which is considerably more than 21 miles. However, the width from Dover to Calais is approx. 21 miles. Thank you for promoting this very important issue. I have to say that I have been both amazed and encouraged in the way over the past 5 years that there has been a increased level of interest in Mental Health and Wellbeing. I have also been impressed in the number of people who have spoken so openly about their personal life journeys and the challenges they had faced. 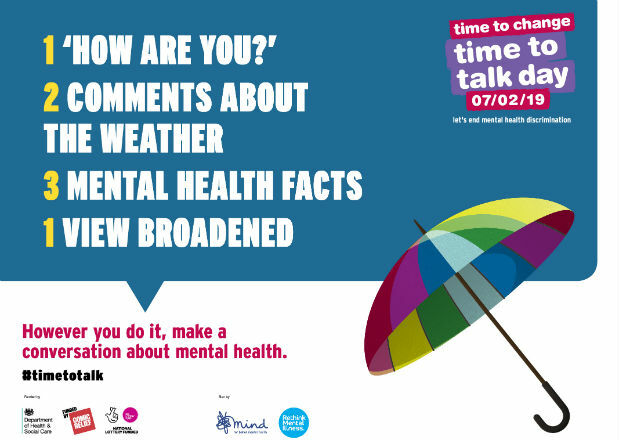 Within the FCO the Wellbeing Network which was only launched in June 2015, was doing its bit to promote Time to Talk Day both in the UK and throughout its Global Platform. I was in Ankara on Feb 7th witnessing the HM Ambassador Sir Dominick Chilcott sign the Time to Talk Pledge. His signatory should be seen as Senior Management backing of the fantastic work that the Staff within the Turkey Network have been doing in the Wellbeing Space to make it a great place to work.